Review date: 17 November 2001. You just ain't a l337 gamer unless you've got yourself some weird-looking controller hardware. A mouse of rare funkitude is essential, of course. You can join the crowd using glowing Microsoft or Logitech optical models if you like, but there are plenty of other funny-looking contenders, and some of 'em even work well. For true LAN party cred, though, you also need some sort of special controller under your other hand, with ergonomically laid out buttons for weapon selection and team chat and stuff like that. Like, for instance, The Claw, which I reviewed a while ago. 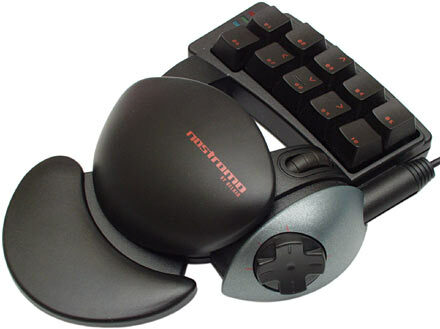 These other-hand gadgets are typically as asymmetrical and thus right-hand-chauvinist as the lopsided ergo mouses that lots of people use these days. They fit neatly under a left hand, and poorly if at all under a right. But as long as you're a right handed gamer, there's a lot to be said for a left-hand controller that lets you press just the right key at just the right moment. It should stop you getting your finger stuck between the key for Do A Happy Dance and the one for Stick Your Thumb In Your Ear, when you're trying to press Throw A Grenade. So, without further ado, here are Belkin's entries in both the funny lookin' mouse and button-encrusted left hand widget categories. Well, you're certainly not going to mistake it for anybody else's product, are you? The n30 Game Mouse sells for a fairly hefty $AU79.95, but for your money you get a USB mouse unquestionably unlike any other. The protrusion on the left side is, according to Belkin, a "Battle Wing", and there's one thumb button on it. Which'll become a little-finger button if a left-hander tries to use the mouse, and be very annoying. But lefties should have stopped reading a few paragraphs ago anyway. You might think that this mouse has four buttons, because it's got the wing button plus a wheel doohickey between its main buttons. Most wheelie-mouses without fancy side buttons are three button units; you click the wheel down for the button-three function. 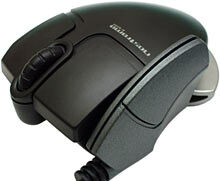 The n30, however, is only a three button mouse. Its wheel doesn't click down - it just rolls back and forth. It does that rather pleasingly, though; the wheel's large and covered with quality non-slip rubber, and it's got a decent level of notchy tactile feedback as well. The n30's major point of unusualness isn't immediately visible, though. You've got to take the lid off to see it. ...you'll have to deal with a blast from the past. Look. A mouse ball. How quaint. I don't know about you, but I wouldn't want to be a company that's trying to sell ball mouses to gamers right now. 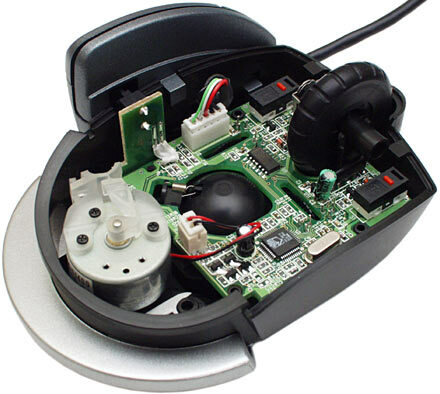 People who spend hours on end scooting their mouse around on a surface covered with hand salsa generally harbour a cordial hatred for old-style opto-mechanical mouses. And for good reason. Ball mouses work fine when they're new. Then they accumulate crud, and you have to clean them over and over, and it's a pain. Ingenious devices exist to make the cleaning task less onerous, but avoiding it altogether is a better solution. 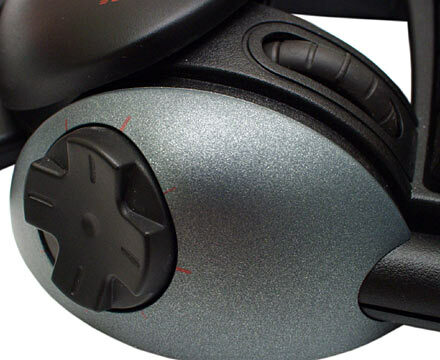 Gamers - and lots of other people - prefer all-surface optical mouses, which weigh less and practically never get dirty. If they do manage to get dirt on their lens you can clean them with a tissue in about two seconds. And the current optical models track well enough to deal with pretty much any movement, even the wildest twitch-game thrusts and spins. Once you've recovered from the shock of seeing the ball and removed the n30's lid, you get to see pretty ordinary opto-mechanical mouse giblets, except for the dingus at the back. That dingus, in detail. 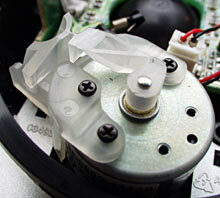 It's a shaker motor, somewhat like unto a pager buzzer, only capable of a wide range of frequencies. It's the same shaker that you'll find inside Logitech's "iFeel" mouses, which I reviewed a while ago here, and it's there for the same reason. Like Logitech's mouses, the n30 supports Immersion's "TouchSense Technology", which allows your mouse to vibrate in various ways in response to what you're doing. So it can buzz in a variety of different styles as you do normal Windows tasks, and also give you game-console-style buzzy feedback when you're playing games. Here's the Immersion Desktop utility that lets you configure the buzzy mouse's behaviour in Windows. Games have to support TouchSense explicitly, but a fair few do. As I said in the iFeel review, TouchSense pretty much leaves me cold. I do not want my mouse to go clicky-clicky-clicky when I shoot a machine gun in a game. My mouse going BUZZZZZZZ when my on-screen car slams into a wall does not enhance my enjoyment of the event. And, since my eyesight is good, I don't need an input device that palpates my palm every time the Windows pointer moves onto something clickable. If you like the idea of TouchSense, then the n30 is a somewhat cheaper way to get it than Logitech offer. But the basic Logitech iFeel Mouse is selling from Aus PC Market for only $AU93.50 delivered; the n30's unlikely to save you more than $AU10 on that. 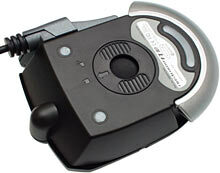 The basic iFeel is a three-button wheelie-mouse too (with the normal clickable wheel), it's optical, and left-handers can use it. The optical pickup alone's worth more than the price difference, if you ask me. The n30, regrettably, has other issues too. The wheel on my review n30 doesn't consistently send one wheel-signal per physical wheel-notch. It quite often does nothing for one step, then steps twice if you advance it another notch. This is a serious problem, and by itself makes this mouse hopeless for games where you actually want to use the wheel. For desktop purposes an unreliable wheel is seldom a big deal. But if you want to use your mousewheel to select weapons in a game (for instance), you very probably don't want to be trying to switch from Weapon 11 (Plasma Lawn Edger) to Weapon 12 (Nuclear Gatling Melon Baller), and have it not happen the first time you try. And then try again, only to zip right past 12 and wrap around to Weapon 1 (Hot Marshmallow On A Stick). And that's not the end of the irritation. See that silver thingy around the bottom of the back of the mouse? Belkin allege this "Bumper Design" shelf-thing to be a "Unique Element" which "adds stability, accuracy to your mouse". As far as I can see, the bumper serves no function beside making the mouse look cool. And it sticks out rather a lot on the mouse's left side (toward the camera in the above picture). The Unique Bumper's rather sharp corner (there's a nice rough mould-mark right on the tip...) thus digs into the base of my thumb when I try to use the n30. Any time the heel of your hand is resting on the mat behind the mouse, the corner of the bumper will be annoying you. Unless you hold the mouse unusually far back, that is. In which position your thumb won't be able to reach the curved-down front part of the third button, so you'll have to move your thumb up the best part of an inch to press the higher rear section of the button. Leaving your thumb in the right place to press the third button, then, is uncomfortable, and the button's lightly enough sprung that you'll press it by accident. I could easily smooth the bumper's corner off, but I'd have to slice off quite a chunk of plastic to make the thing comfortable. Since the whole Bumper's just a pointless decoration, you could just bust the tabs that hold it in place and then fling the thing, I suppose. But that's assuming that you bother with an n30 in the first place, which I think you'll agree is looking increasingly unlikely. OK. The mouse ain't great. How about the SpeedPad? The $AU69.95 n50 SpeedPad is, unlike the n30 mouse, quite comfortable, for anybody who doesn't have unusually small hands. 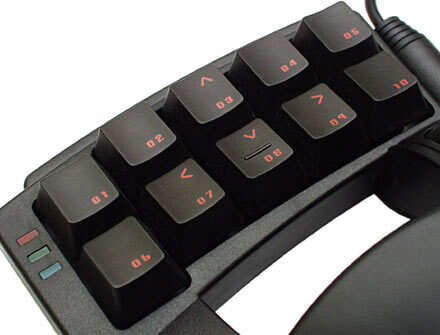 Rest the heel of your left hand on the plinth provided and a smooth curve of plastic supports your palm, leaving your fingers free to work the ten Action Buttons, and putting your thumb neatly on the four-way directional pad on the side of the SpeedPad. Slightly less convenient, but still no big deal to reach with your index finger, is the throttle wheel. This wheel has end-stops and no notchiness, but it's otherwise the same as the nice-feeling n30 mouse wheel. The Action Buttons work like normal keyboard keys, with a bit of tactile click and enough travel for a decent feel. The eight-way pad's less satisfying; it's squishy, with no feedback to speak of. You can assign all of the SpeedPad's controls to a variety of functions, including any keyboard key you like, and complex macros. The macros can include delays between events, for rocket-jump tricks and the like. There's a red, a green and a blue LED on the Pad's corner, and they light up to tell you which of three quick-access setups you're using, so it should be easy to integrate the SpeedPad into your gaming life. Well, it should if it works, anyway. The one I got didn't seem to. The SpeedPad installation instructions sternly warn that Win2000 users need to plug in the Pad before they install the software. Well, it didn't matter in what order I plugged and installed on my Win2000 test box; the SpeedPad driver-finding process always failed with a hugely informative "a function driver was not specified for this device instance" error, and that was all she wrote. The setup software seemed to install OK, but the driver was irretrievably borked. So I tried a Win98 machine instead. Now there weren't any errors, but whenever the SpeedPad was plugged in, various basic Windows tasks like clicking on things on the desktop took a few seconds, instead of happening instantly. Unplug the SpeedPad and everything's fine; plug it back in and everything's awful again. Apparently the throttle being advanced when you plug the n50 in can cause problems, if you've set the throttle up to send continuous key-press signals when it's not centred. But I hadn't set anything up to do anything yet. At this point, I'm afraid I tossed the SpeedPad into my "life's too short" basket. The heck with it. It's worked fine for some other people, apparently. Check out the reviews on PlanetQuake and The Adrenaline Vault, for instance. But since I'd already been given the urge to smash a peripheral by the n30 mouse, I didn't trust myself to keep trying to figure out the n50's major malfunction. 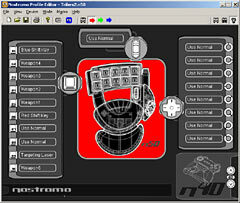 Here's the Nostromo Profile Editor software that's meant to let you set the SpeedPad up. The profile software comes with a large selection of pre-made profiles, covering plenty of current games, so you don't have to roll your own from scratch. If you want to, though, you can. Just from sitting the n50 on the desk and fooling with it, and from reading the abovementioned two reviews, I have no trouble believing that the SpeedPad is a pretty good product, assuming that it works. If I get a spare moment I'll try the SpeedPad on some more computers and see if I find one somewhere on which it functions. But neither of the PCs I tried have any serious USB personality defects I know of - they both run USB mouses, one of them has a USB memory card reader as well, and the other one has a webcam - so I can't see any obvious reason for the problems. Maybe I was radiating anti-Belkin rays after being annoyed by the mouse, or something. As mentioned above, the n30 Game Mouse is not good. It's uncomfortable, its pickup is antiquated, it's expensive, and the reason it's expensive is because it contains a buzzing thing that you probably don't want. If the Logitech iFeel Mouse didn't exist then the n30 would have a niche. But since the Logitech product does exist and is substantially technically and ergonomically superior, despite costing only slightly more, I can see no good reason to bother with the n30. If you assume my experience with the n50 SpeedPad to be anomalous, it looks rather good. A decent selection of controls but not so many as to be annoying, flexible support software, not too expensive, good looking, feels nice. All this is for naught if the darn thing worketh not on your PC, of course. Check the n50 out, if you're in the market for such a device and feeling lucky. Avoid the n30 at all costs.